On Saturday November 10th, 2012 from 11am – 4pm, World Origami Days (WOD) will be celebrated at the One Corner Gallery, 39 School Street, in Arlington, VT.
World Origami Days is a two-week international celebration honoring the art of Origami. This global event traditionally begins October 24th, the birthday of Lillian Oppenheimer (1898-1992), founder of Origami USA. It ends November 11th, the day designated in Japan as Origami Day. For our local celebration, we will be distributing free origami figures including flowers, animals, geometric modular rings and stars, among others. There will also be a handout that includes fun facts about origami, the World Origami Days Celebration, and useful resource suggestions including books, publications, and websites. Origami is a wonderful process-oriented tool that can both teach and entertain. It is always gratifying to see the creative and educational benefits it brings to people of all ages. If you are around Southern VT on November 10th, come and celebrate with us! Update: Some people asked me for instructions for figures appearing in the picture above. Here I highlight those for which I can provide instructions. Click on the links below the photo. Not a subscriber yet? Click here to subscribe to this blog and receive coming posts via e-mail. 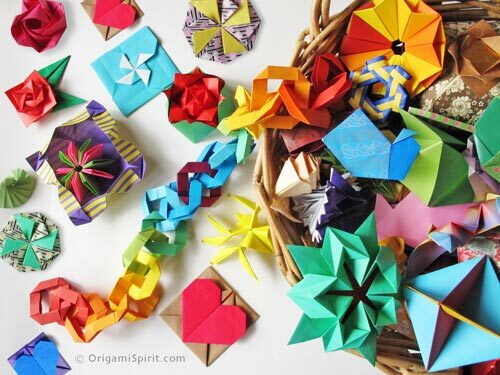 I do love that basket full of Origami … so colorful. Can you tell me where I can find instructions for that little heart envelope? I would love to fold it myself. I have a post and video for the heart you mention. Please visit this link. Next post: Fold the Perfect Origami Bird for Greeting Cards!